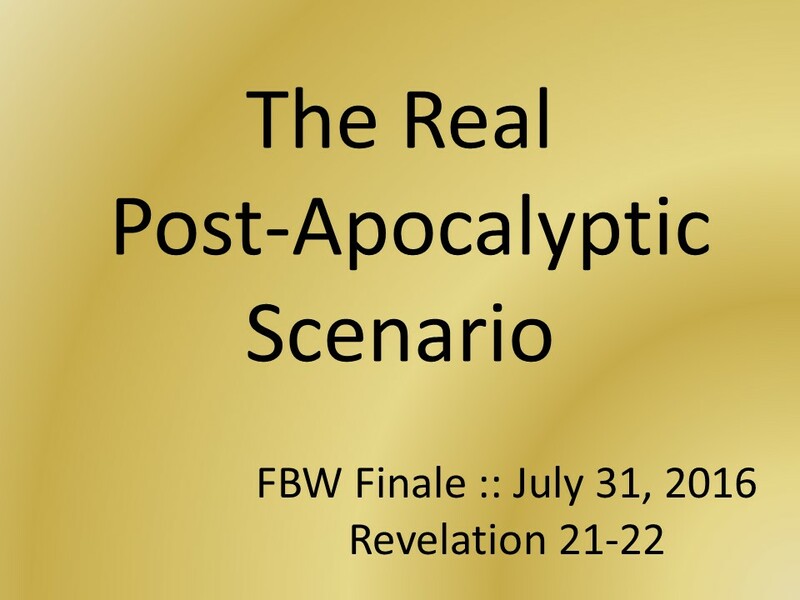 [Matt's Messages] "The Real Post-Apocalyptic Scenario"
I invite you turn with me in your Bibles, if you would, to the Book of Revelation, chapters 21 and 22. The “Apocalypse of John,” Revelation (not Revelations), chapters 21 and 22. Apocalyptic literature appears in our Bibles in several places, most notably the books of Ezekiel, Daniel, Zechariah, and Revelation. One night, we studied Ezekiel one together. That’s some pretty far out stuff! We learned all kinds of stuff in this week–probably too much stuff. It’s so complex and difficult to sort through, I’m sure that I thoroughly confused everybody in the class at one point or another. At the same time, I think that everyone who came learned a little bit about apocalyptic literature, as well. About how this kind of genre works and what kind of a spiritual effect on us it is intended to create. I hope that we’ve all grow spiritually because we’ve spent some time together in this amazing and crazy genre in our Bibles. What the world would be like if some apocalyptic or world-ending event occurred and what would happen to the survivors. What life would be like after an apocalypse. There are TV shows like the Walking Dead. There are movies like World War Z or I Am Legend or The Book of Eli or Planet of the Apes or even Wall-E. Right? And many of the video games the kids are playing these days presuppose a post-apocalyptic scenario. What God says will certainly happen after the Apocalypse. Not just a theory or a probability or an hypothetical idea. 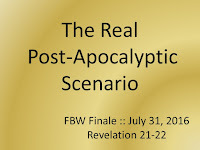 But what the real God has really revealed about what reality will be like when the end of the world really occurs. And to get that, we read the last two chapters of our Bible. Revelation chapter 21 and 22. The Great Story began in Genesis chapters 1, 2, and 3 on the first two pages of your Bible. God made a very good world and put very good people in it to enjoy it and rule it and to enjoy Him and serve Him forever. But as we saw back in December, in the third chapter of this Great Story, everything went wrong. The very good people rebelled against their Creator and the very good creation was put under a curse. And Revelation 21 and 22 are the End of the Great Story, the last 2 pages of our Bibles. Jesus has brought us Resurrection Bodies. He has crushed His enemies. He has judged all mankind. He has ruled for a thousand years. He has tossed the unholy trinity of the devil, the beast, and the false prophet as well as death and Hades into the lake of fire! This is the very definition of “post-apocalyptic” – after the end of the world as we know it. Revelation 21 and 22 is the Apostle John’s last vision in the book of Revelation. It was a vision revealed to John by God Himself. It was a vision of New Heavens and a New Earth. The Real Post-Apocalyptic Scenario. What I want to do this morning is to slowly read these two chapters and point out many details as we go along. And then I want to answer three big questions about The Real Post-Apocalyptic Scenario. I can’t answer all of the questions or point out all of details, there just isn’t enough time, and as we learned this week at FBW, frankly, I don’t have all of the answers to all the questions about these two chapters! 1. What Will Not Be In The Real Post-Apocalyptic Scenario? 2. What Will We Do In The Real Post-Apocalyptic Scenario? 3. What Should We Do About The Real Post-Apocalyptic Scenario? Now, remember, this prophecy is apocalyptic literature. It is full of mind-bending symbols that layer on top of one another and come at you as in kaleidoscope of symbolic meaning. John is seeing a vision that is full of symbol-laden reality about the future. He says that he sees a city, the new Jerusalem, coming down out of heaven from God, prepared as a bride! A city-bride! A bride that is a city. How’s that for mixed ideas? A New Heaven, a New Earth, a New Jerusalem like a bride–beautiful, radiant, ready–a bride. Theologians call this the “Consummation of All Things.” All things in Heaven and Earth are being united under Christ (Ephesians 1:10). This New Jerusalem connects a New Heaven and a New Earth so they are now unified. Wow! This is what it will be like the real post-apocalyptic situation. For those in my class this week, did a whole bunch of bells and whistles and lights come on when you read that? We only made it up through chapters 1 to 5 this week, but all of those things were in them, weren’t they? This is where it’s all headed. What does that remind you of? Does it remind you of the Tabernacle from Exodus or Solomon’s temple in 1 Kings? Beautiful, magnificent, mysterious. Was there a cube in the Temple? The inhabitants of this city walk on gold. That’s how precious the city is and how little gold has value in this post-apocalyptic world. Can you see how this gives us the perspective we need to keep living in our times and to keep living for the Lord in our times? Now, again, there is no way that we can play out every detail here. I don’t know what a lot of this means. I have ideas. I have studied, it but there’s just too much here. It invites a life-time of study! #1. WHAT WILL NOT BE IN THE REAL POST-APOCALYPTIC SCENARIO? Now, I don’t know if that is literal or not. There are definitely going to be rivers and probably lakes. And maybe oceans. But it says that there will not be any seas. That’s because the sea was for Ancient Israelites a symbol of chaos and evil. It was an unstable, uncontrolled, chaotic, killer that separated people. We are to think of the sea here as the source of evil. The Beast of Revelation chapter 13 comes out of the sea. But now, there is no sea. Death has died. No more funerals! No more funeral homes. No more graveyards. No more sad goodbyes. Death is gone. Can you imagine? This was the first Family Bible Week without Blair Murray. He loved the Bible and he loved aviation. And I think a lot of us were missing him this week in a special way. Who else are you missing right now? Who do you love that is no longer here, ripped away by death? In the world’s post-apocalyptic scenarios, the new world is ruled by death. Zombies roam the world. But in the real one, there is no death. And there is no (v.5) mourning.If there is no death, there is no mourning. No grieving. No bawling our eyes out that we have lost children or spouses or parents or grandparents. And there is no (v.4) crying. Can you imagine? The beginning of verse 4 says that God Himself [!] will wipe every tear from our eyes! One year ago, I had just had my surgery and I was in a world of post-operative pain. Our surgery list in our prayer list right now is so long. And how many are experiencing chronic pain. My wife is learning to live with chronic pain. There will not be any sinners in the post-apocalyptic world that God’s people will inhabit. No unrepentant sinners that is. There will be billions of sinners saved by grace. What will not be in the post-apocalyptic situation? Apparently, there won’t be any church buildings either. We won’t need to be drawn into worship. We just will worship everywhere we are all the time with all of God’s people. Nothing impure. None of that bad stuff on the internet will be there. No Sea, No Death, No Mourning, No Crying, No Pain, No Sinners, No Temple, Nothing Impure, No Curse. That’s what Eternity is going to be for those who belong to Jesus Christ. Amen? Question #2. WHAT WILL WE DO IN THE REAL POST-APOCALYPTIC SCENARIO? Now we've seen what isn’t going to be going on, what will happen? It may be a literal city, as well. I am not ruling that out. Randy Alcorn and others have made a solid case for the New Jerusalem being a gigantic capital city of the New Heavens and the New Earth. But know that this apocalyptic literature! So we know that this city is first and foremost an apocalyptic symbol. Who or what is the city in Revelation 21 and 22? John tell us that this is that. And it is, amazingly enough...you and me! Corporately, perfectly knit together in a perfect community, a perfect society, a perfect people for God. [Many have pointed out that] the Bible began in a garden and ends in a City. A Garden City. Remember the River that runs down the boulevard and the Tree of Life from the original garden that heals the nations? A Garden City. We will shine with the very glory of God. Heaven will not be passive. It will be eternal rest, yes. But it will be active rest! We will not sit around for all eternity. We will serve the King of Kings like we were made to do! Do you remember when we talked about this last Fall during the series we did on work? We will have work to do in the real post-apocalyptic situation. At least part of our work will be reigning. Chapter 22, verse 5. “And they will reign for ever and ever.” That includes us! Reigning with God over the New Creation! No! If you are afraid of Heaven because you are afraid of being bored, you are afraid of the wrong place. Hell will be the most boring place ever imagined. It will be the same terrible punishment day after day forever. Heaven will be the most exciting place that is conceivable (and then some!). Now, that should shock us! If nothing else in these two chapters shocks you, this should. But we’re going to see His face! And we’re going to live forever. This is where our relationship with Jesus Christ blossoms into what it was made to be! This is the ultimate life-changing relationship with Jesus Christ! And it means the fullest, most awesome relationship possible. Chapter 21, verse 3 started with this declaration:. This is the consummation. This is where our relationship has been going all along. Total intimacy with God. The phrase “dwelling of God” in 21:3 is literally, “Tabernacle.” Now God is tabernacling with men. He will live with them. He did that in a veiled way that first Christmas, God became man and tabernacled among us. But this is more like in 1 Kings when the glory of God comes down in His shekinah glory and fills the tabernacle. And there is no veil here. Here, the entire city-bride is a Tabernacle. And God lives with us! #3. WHAT SHOULD WE DO ABOUT THE REAL POST-APOCALYPTIC SCENARIO? We learned about that important word in Revelation this week on Wednesday. It means to persevere in faith under pressure. To not stop believing. To hang on to Christ. To hold onto Him and overcome or conquer or win by faith. And the only way to know if you name is there is to turn from sin and turn to the Savior. Putting your trust in Jesus Christ and in His death on the Cross on your behalf. And not stop believing in Him. My class knew I was going to say that, didn’t you? I don’t know how someone could read and study these two chapters without worshiping God! This is our God! This is what our God has planned! Worship Him! Don’t worship the creation. Don’t worship yourself, your friends, your girlfriend, your boyfriend, your spouse, an angel, a false god, Baal, Allah, Science. You are going to see the Face of God. Start worshiping Him now. And #3 (and last). Long for Jesus. We long for everything to be the way it should be! We may not long for the apocalypse, but we long for the post-apocalyptic world. And most of all, we long to see your face! [Matt's Messages] "The LORD Is God!" Because right now, we aren’t learning about all of the kings in the North and the South. We’ve already met 13 of them as the book has progressed (most of them thumbs-down guys), but now we’re concentrating just on the northern kingdom of Israel and not so much on its no-good-very-wicked king Ahab, as on the prophet who has burst onto the scene and fired this first salvo in the war against Baal. So Elijah declared that it was not going to rain. And remember, that was a direct attack against the glory of Baal. Because supposedly Baal was the god of rain. The god of fertility and successful crops. But there was no fertility and no successful crops. Just think about that. We’ve gone, what three weeks without any real rain here to speak of. And how dry it is. The good side is that you don’t have to mow. The bad side is that the grass is all brown and dying. That whole time Elijah is hiding out from Ahab and Jezebel. They have a contract out on him and any other prophets of Yahweh. Last week, we saw how the LORD provided for Elijah from unlikely sources like dirty ravens and Gentile widows. Three years the widow’s flour and her oil don’t run out. And Elijah lies low under the radar. Actually living in Sidon, Baal-territory. But now, the LORD has a new mission for Elijah. He’s going to send some rain. Ok. I’m going to tell you the title of this sermon now. And after you hear it, you’ll know the whole point of the story. So, you can go home after you get this title. Now, I recommend sticking around to see how it plays out. And if you already know this story, which probably most of you do (it’s one of the only stories most of us all know from the books of Kings, if you know this story already), I encourage you to pretend that you don’t. Try to read it and listen to it verse by verse as if you don’t know what’s going to happen. Ok. Are you ready for the title? It’s a doozy, too. Okay. It doesn’t sound that exciting, but it is. It’s one of the most important sentences in the whole history of sentences. Now, my guess is that everyone here already believes that. Or why else would you have come to church today? Maybe somebody dragged you here. Or maybe you’re checking it all out. If so, I’m glad you’re here. But it’s, strangely enough, easy to forget. That’s what had happened in Israel. The whole northern kingdom had turned to false worship, even Baal worship. And the LORD will not stand for it. Yahweh must demonstrate that He is God alone. So, He shut off the rain. And now, He’s told Elijah that He’s going to turn it back on again. This gives us a little picture of what these three years have been like. There are still followers of Yahweh, but they have to be sneaky. Even the guy in the charge of the palace, Obadiah (not the prophet), is a closet follower of Yahweh and he’s been hiding a 100 prophets and supplying them with food and water. But Ahab doesn’t care about these prophets. He doesn’t mind them dying at the hands of his wife. What he really cares about is his livestock. You can tell what his priorities are. And everything around him is dying. Baal is not coming through. So he sends Obadiah out and they separate and scour the countryside looking for water. Yes, I’m coming, and you’re really going to see something now. Do you see the face-off here? Look at the death and destruction everywhere around you. Israel is dying of thirst! That’s one of the major messages of the books of Kings. When you worship false gods, there is trouble and cursing and danger and death. 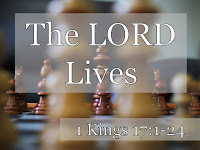 But the LORD lives. The LORD is God. It’s time for a showdown. And you probably already know the story. But humor me for a few minutes and pretend that you don’t. Mount Carmel was apparently Baal territory at this point. So there was home court advantage to the followers of Baal. Here’s point number one this morning, of three. #1. CHOOSE TO FOLLOW HIM ALONE. Elijah really gets in their faces, doesn’t he? The word “waver” means to hobble or limp. How long are you going hobble around choosing what side you’re on? You know the craziest thing about this contest? It shouldn’t be happening! This is Israel! They should have decided who was God a long time ago. And even here they won’t say anything. Wade Nolan, when he was here back in February, said that a lot of guys like to hang around on the fence and eventually decide to whether or not to follow Jesus. Now, I’m guessing that this is not a hard choice for anyone here today. Anyone here tempted to follow Baal with your life? If so, meet me in my office after the service. We’ve got to talk. But that doesn’t mean that we don’t have a problem with idolatry. And I doubt that he meant the ones made of wood, iron, and stone. What is like Baal for you? What false gods are you tempted to worship? Baal may not be tempting, but I’m guessing there is a false deity or two that is actually appealing. I’ll give you two of mine. They’re ones I’ve said before. You probably know mine better than I do because our idols are often more obvious to others than they are to ourselves. I tend to worship the gods of popularity and comfort. I love to be liked and approved of by others. The Facebook “like” button can be a drug for me. And I have an extra plate addiction. My gluttony tends to come not from just enjoying the pleasure of eating too much but looking for satisfaction and comfort in the act of eating. And when you put the two together, like getting approval for how much I eat, then I can really get into trouble. Now, there’s nothing wrong with liking to be liked or enjoying comfort. But good things can become god things when we allow them to take a place they do not deserve in our lives. And even though I am a declared follower of the LORD, I can be tempted to waver between the two. Don’t just say that you believe in God, live like it. You can’t serve two masters. Stop trying! This applies to other religions, too, of course. If the LORD is god, follow him; but if Allah is God, follow Him. If the LORD is god, follow him; but if the god of the Mormons or the Jehovah Witnesses, or the Hindus or whatever is god, then follow them. But choose. There is no fence. Choose to follow the LORD alone. “Then Elijah said to them, ‘I am the only one of the LORD's prophets left, but Baal has four hundred and fifty prophets. Get two bulls for us. Let them choose one for themselves, and let them cut it into pieces and put it on the wood but not set fire to it. I will prepare the other bull and put it on the wood but not set fire to it. Oh, by the way. Have I mentioned that Baal was the god of lightning? He was the storm god. So supposedly, he not only brought the rain but also the fire from heaven. So, you can see why they like it. They’re starting to get worried that their god isn’t going to show up. The shot clock is ticking down. I love it when Elijah does this trash-talking. What do you mean nobody’s home? You know, he might be sleeping. Now, catch this. Why doesn’t Baal respond? Because Baal is not real. They don’t get a busy signal when they call. It just rings and rings and rings. Do you know why? Baal is not God. But it’s not really a battle with Baal. And the same thing is true of all of the other religions in the world and all of the counterfeit gods that you and I are tempted to give some portion of our lives to. Popularity or comfort or money or possessions or pleasure or politics or sports or some other person. End the end, they do no show up. They are not God. But you’d have a hard time convincing these people. They try so hard. They do whatever they think it will take to get their god’s attention. That’s the reward for idolatry. Where did they get the water? There’s been a drought for 3 years, and Elijah wants to pour water over this sacrifice. So they get this water and they make sure that there is no way on Earth that fire could break out on its own. “At the time of sacrifice, the prophet Elijah stepped forward and prayed: ‘O LORD, God of Abraham, Isaac and Israel, let it be known today that you are God in Israel and that I am your servant and have done all these things at your command. They got the point, didn’t they? You know, I never noticed the rocks and the soil before. I always thought they were scorched (and that might be all it means), and I was amazed that all that water was licked up. But if I’m reading it right, the rocks and the soil burned up, too. Dirt’s really hard to burn, right? V.38 again. “Then the fire of the LORD fell and burned up the sacrifice [which is amazing], the wood [there goes that altar! ], the stones and the soil, and also licked up the water in the trench. That was some really hot fire from heaven. They will not trouble Israel any longer. Choose to follow Him alone. #2. CHOOSE TO PRAY TO HIM ALONE. Did you notice how calm and collected Elijah was when he prayed? He prayed earnestly and passionately, but there was no jumping around and cutting himself and putting on a big show. He just prayed a simple heartfelt prayer and the fire fell. That’s because the LORD is God. So, now it’s time to pray for something else to fall. Three years and no rain because of the prayers of Elijah. It’s time for Ahab to make a decision. King Ahab has a chance here to make everything right. To turn the nation back to Yahweh. He’s told to eat and drink and watch and see what the LORD is going to do. Elijah prays. And he prays. And he really prays. He’s praying based on the promise from verse 1 and what Solomon said back in chapter 8. He knows that LORD is God, so he prays a big prayer request. Now, that’s as far as we’re going to read today. We’re not going to find out what happens with Ahab. He’s got “the Flash” out in front of him. Maybe Elijah is a forerunner, and Ahab is going to repent and lead the nation into revival. But we know one thing. It’s raining. And he prayed, not just to any old deity, but to Yahweh. That’s the point that the Apostle James makes in his letter. Chapter 5, verses 16-18? Why is the prayer of a righteous person power and effective? Because the LORD is God. Don’t forget that you are praying to the God of fire and rain. You’re praying to the same God as Elijah was. We’re just like Elijah. We’re just people. But we know Yahweh! So bring your big prayers to Him. There’s a song by John Newton that very few people know. It’s not like Amazing Grace, but I think we need to bring it back. “Thou art coming to a King. The LORD is God. Choose to pray to Him alone. #3. CHOOSE TO CONFESS HIM ALONE. We don’t really have time to develop this thought, but what I want to leave ringing in our ears is the cry of verse 39. That needs to be our confession, as well. And Jesus is Yahweh in the flesh. When Jesus was born, it wasn’t just fire and rain that came down. The LORD Himself came down and gave us the perfect sacrifice. Not just a bull on an altar, but a Savior on a Cross. And then a risen Savior, an exalted Savior, and one day a returning Savior. Jesus is God! Jesus is God! And so many people need to hear it all around the world. The LORD. He is God. Jesus. He is the LORD. 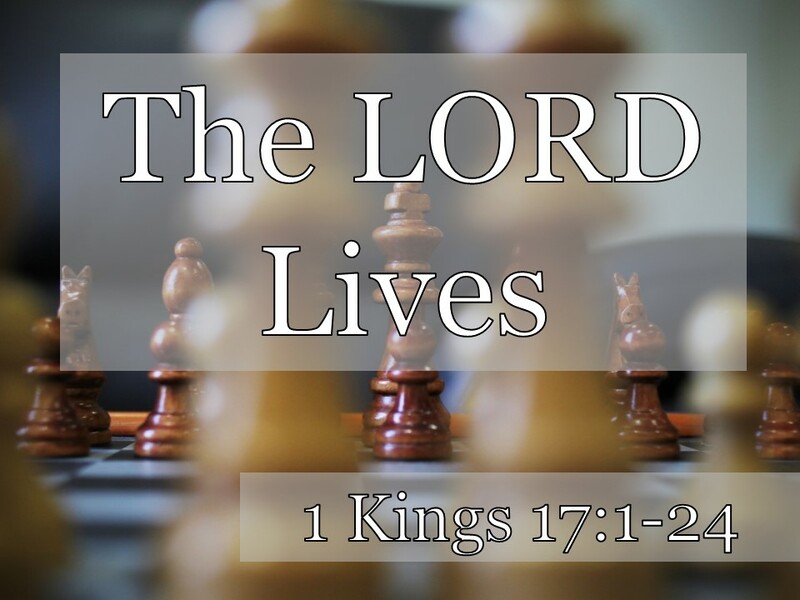 [Matt's Messages] "The LORD Lives"
Our series is called “The King of Kings in the Books of Kings,” and we’ve been learning a lot over the last 10 messages in this series about the kings of Israel, both good and bad. More bad than good, I’m afraid. And when they are at their worst, they reminds us why we need Jesus. And we’ve already learned about 13 kings so far between the northern kingdom of Israel and the southern kingdom of Judah. Now, this morning, we start a new section of 1 Kings that’s a little different from what we’ve seen so far. Today, the focus shifts a little off of the kings for a while and onto a prophet who bursts onto the scene with absolutely no warning. And his name is Elijah. A pretty significant character in the Old Testament! This chapter, 1 Kings 17, is where he comes into the story. But I didn’t. Because 1 Kings 17 is not at its deepest about a prophet or a priest or a king. 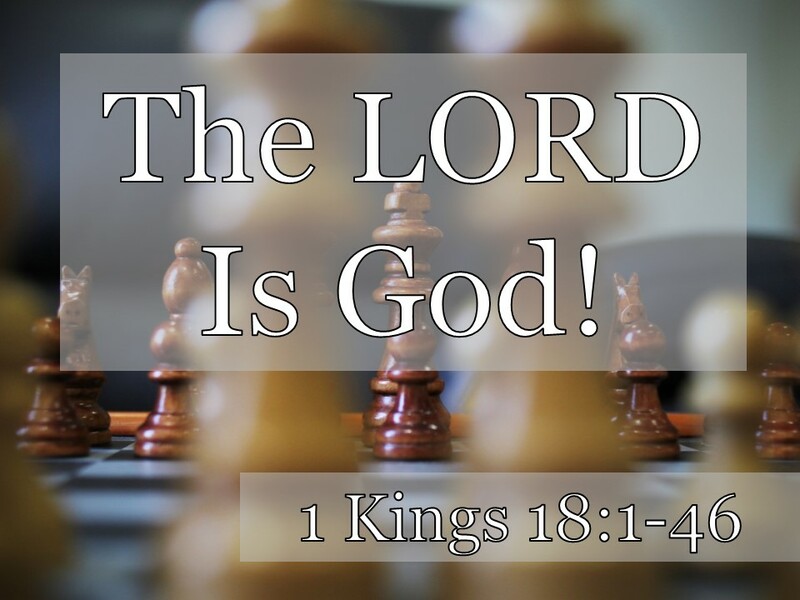 The LORD is the main character of books of Kings, and He is the main person Whom we encounter today in 1 Kings 17. So, I actually took my title from a little phrase in verse 1. Where Elijah says that the LORD (capital L-O-R-D) lives. The God whom the Bible calls Yahweh, the God of Abraham, Isaac, and Jacob, the God of David and Solomon. The God over Israel and Judah. Capital L-O-R-D. That God lives! And by that, I mean that He exists. He is not just a myth or a story or a made-up fairy tale. Now, you all have come to church this morning so I could probably guess that you already believe that. The LORD exists. And not just like a rock exists. He’s alive. He’s personal. He’s relatable. And He’s true. We believe that. ... Or least we say we do. But there was a real question about it in Elijah’s day. Idol worship had crept into Israel. Remember Solomon fell for it and then his son did, too, in the South. And they fell for idolatry even worse in the north. Jeroboam set up those golden calves in Bethel and in Dan. Remember that? He set up a whole invented religion. But then it got worse. Because instead of just falsely worshiping Yahweh, they began to introduce other gods. And the worst at it so far was the last king we met last time. Ahab was not a Arab. He was a Jew. The king of the Jews. Remember this? Chapter 16, verse 30? “Ahab son of Omri did more evil in the eyes of the LORD than any of those before him. He not only considered it trivial to commit the sins of Jeroboam son of Nebat, but he also married Jezebel daughter of Ethbaal king of the Sidonians, and began to serve Baal and worship him. He set up an altar for Baal in the temple of Baal that he built in Samaria. Ahab also made an Asherah pole and did more to provoke the LORD, the God of Israel, to anger than did all the kings of Israel before him” (1 Kings 16:30-33). Ahab acted as if Yahweh did not exist. He treated the LORD with contempt. And he set up worship of this other god, Baal, in Israel! And what do you think? Will God let that go? The true God will not take this lying down. Elijah just comes out of nowhere, doesn’t he?! Bam! There is he talking to Ahab out of the blue. Because more important than who he and where he comes from is the message that he has to present. This guy means business. And that’s the because the LORD lives, and He means business. These are the opening shots in a great battle in Israel. Because Elijah, in making this declaration, is taking a swipe at Baal. Do you know what Baal was the god of? He was the god of rain. He was the rain god and the god of fertility, the god of life so they said. So what was Yahweh saying by sending Elijah? The LORD promised this back in Deuteronomy. He said in Deuteronomy chapters 11 and 28 that if Israel abandoned their covenant with Yahweh, He would withhold the rain. And now He’s making good on that threat. How devastating that would be for inhabitants of this land. No rain, no life-giving dew. Just whatever they can find trickle in or transport in from other lands. Elijah had to say this up front or they wouldn’t have known that it was Yahweh. They might have said it was a coincidence or tried harder to get Baal to do his thing. But before the rains stopped, Elijah said they would. That’s what happens when people give in to idolatry. People suffer. People get hurt. Idolatry always leads to death. Idols promise life and blessing, but they always bring trouble and death. Elijah was in trouble. Ahab didn’t like what Elijah had to say. In fact, he put out a hit on Elijah and any other prophets of Yahweh. So the LORD placed Elijah in His own special witness protection program. Verse 2. King is such a crazy book and whenever these prophets come on the scene, you never know what’s going to happen. Here, the “word of the LORD” comes to Elijah. Remember that phrase from a few weeks ago? That’s an important phrase. The LORD who lives also speaks. And what He says should be listened to and believed and obeyed because it always comes to pass. “Hide in this ravine. Where there would normally be no food and in drought conditions, there would be no water. Those things are unclean. And the LORD is using them? I’m not sure I want to know. But if you cook it, it will keep you alive. Don’t rely on Baal. Rely on the LORD because He’s real. He lives. He tells the birds what to do! Here’s application point number one of three this morning. There is so much in life right now that tempts me to worry, to grow anxious. We all have our list. When you wake up in the morning, and you start to go over that list in your head. I’ve got my list. I’m sure you’ve got yours. What’s at the top of the list? God is real. And He is able to protect and provide and sustain us in amazing ways. Don’t worry. If God still has a job for you, then He will sustain you until that job is over. Elijah was on a mission, and he was indestructible until that mission was over. Are you and I on a mission? The Challenge Group said last week that we are. We are a family of servant missionaries SENT on a mission. And the LORD will take care of us. I know that’s hard to do. Worry is my superpower. I come by it naturally. I am the son of worrier, and the grandson of worrier. But God can send ravens to take care of me if He wants to. Now, that might be even crazier! Where is Zarephath? In Sidon. That’s Baal territory. Move to Baalsville where you are a hunted man, and I’ve got someone to take care of you. Are widows, in the Bible, people with money? People with means? People with stuff to give? No, widows in Bible times are often destitute and needy. They are very unlikely benefactresses. But, of course, the LORD lives and He has a plan. Go and find this widow woman, and I’ll take care of you. What an incredibly sad story! She’s gathering firewood to heat their last supper. She has nothing to offer! The LORD lives, and when He speaks it comes to pass. I love this miracle because it’s a daily miracle. It’s a quiet miracle. This woman didn’t get a truckload of food. A little bit. Every day. His mercies were new every morning. And it’s the kind of thing we experience all the time. I mean, isn’t it strange that the LORD sent Elijah out of the country to get this help? Weren’t there any widows in Israel? Why did Elijah have to leave Israel for this miracle? That’s what Jesus asked in Luke chapter 4. He was in Nazareth, his hometown, and the locals were listening to Him preach. And the liked what He said about the day of the LORD coming. But they didn’t like it when he brought up this story from 1 Kings 17. And you know how they took that? They were so furious, they tried to throw him off a cliff. Because the LORD who lives is gracious to those who will trust Him but He’ll also pass over those who should trust Him but don’t. They were mad because Jesus was going to save Gentiles! But He was going to allow Jews to die in their sins if they ignored and rejected Him. Jesus is the way, the truth, and life. There will be many “good,” upstanding, moral, religious people who will perish on the day of the LORD because they had not received the Lord Jesus. Have you trusted Jesus Christ as your Lord and Savior? I’m asking is Jesus Christ your Master and Rescuer? There were many widows in Israel at this time. And they were, by and large, rejecting Yahweh. So God went out and found an unlikely candidate to shower His mercy on. There will be current members of ISIS in Heaven and current members of EFCA churches in Hell. Because God doesn’t save based on niceness. He saves based on our reception or rejection of Jesus. And there are some in ISIS who will truly repent like the Apostle Paul did on the Damascus road. And there are some I’m sure, hopefully not many, who look good on the outside but have not repented and received Jesus on the inside here in our churches. This widow did not miss out. She trusted in the living LORD. Well, it could just end there and God be justified. He gives, and He takes away, and blessed be His name. The stakes are so high! I don’t know why he laid himself out on the boy three times. A lot of times in the Old Testament, the prophets acts out his prophecy. So he’s probably identifying, his life for the boy’s life and pleading with God for the boys’ life. The LORD lives, and He hears. Don’t despair. Don’t give up. Because the living God can bring back the dead. He is more powerful than death. You know Baal supposedly died a little every year. Their story, the Baal worshipers’ story, was that the rainy season would end because Baal would meet up with the god of death named “Mot” and have give in to him. And then when the rainy season returned, Baal would start up his work again. How convenient. But there was nothing that Baal could do about Mot. Mot was more powerful than Baal. Baal had to yield to death. But death is not more powerful than Yahweh. Yahweh is more powerful than death. This little resuscitation was a foretaste of the resurrection. The LORD lives forever, and so will you and I if we belong to Him. Don’t despair. Even of death. This Gentile widow did. Verse 24 tells us that she believes that Elijah is telling the truth and giving out the word of the Lord. What’s sad is that pretty much all of Israel did not. We’re going to see that next week when we head up for the showdown on Mount Carmel. There is still no water, no rain, at the end of our story today. Because God is still showing that He is more powerful than Baal. More powerful even than death. So don’t give up. Don’t despair. Don’t pull out your hair in worry and fright and desperation and lose hope. Yes, there is trouble and terror in our world. And even terrible death. But take heart. Jesus has overcome the world. He has even overcome death! I told the Challenge Group that if they talked long enough, there would be no sermon. So there is no sermon today. But I do want to wrap up all of what has been said. By coming back to this idea of IDENTITY. We’ve learned all week about Who God is and what He has done and how that shapes who we are and why we are here. Here again are the three symbols to remind us of that. 1. God is Father. And because of that, we are family. It was really encouraging to see the students grasp their identity as children of God. That is what we are! And we are not individual children. We are gathered together into a family. And that is the most important family in the universe. The family of God. More important than the other families the world has to offer, even the good ones. More important than a brotherhood of bikers, a brotherhood of union workers, a family of firefighters, more important than our national brotherhood. More important even than our biological families, is the family of God. 2. God is Son, the servant king sent to redeem us. And because God is Son, we are servants. It was awesome to see the students assume that identity this week on their service projects. I was so encouraged to see them walking up and down the urban streets of Louisville picking up trash and making friends with a predominantly black community. And there was no complaining! They were servants. They lived out Philippians 2. “Your attitude should be the same as that of Christ Jesus.” Who became a servant. 3. God is Spirit, the Holy Spirit. And because of that, we are missionaries. We have the gospel message that the world so desperately needs. Is there any question, after the week our nation has had, that we need the gospel? And we need people to carry the gospel into the world? We are sent into this world, into our neighborhoods, into our community, into our workplaces, into schools, into every area of life to present the gospel and to represent Jesus Christ. We learned that this week. I saw lights go on in our student’s eyes. Raise your hand if you are a missionary. Raise your hand if that is your identity. We are not all called into foreign missions. We are not all called to go to Rio in Brazil, like we learned about at the conference. We are all to LIVE SENT. They were huddled, too. They were huddled in fear and the doors were locked. And then Jesus just appeared and they were overjoyed and said, “Peace be with you!” and then He showed his hands and side to the disciples and they were overjoyed. The Father send the Son, the Son was sending the Spirit, to be received by the disciples and they were then to be sent into the world. A family of servant missionaries. That’s us. That's what we've been learning about all year long. We’re going to how you one more video that captures what we learned. It was created just for our conference using the poetry of David Bowden. He wrote this poem just for us. And they showed the first half at the very start of our conference and the second half at the very end. We’ve given you the words in that handout so that you can follow along if you want.